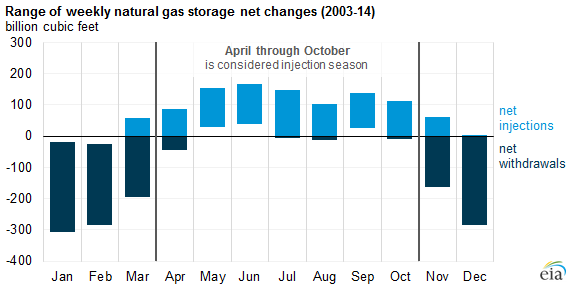 In natural gas markets, analysts refer to the storage injection season as running from April 1 through October 31 of each year, but these dates are not strict cutoff points. In each of the past 11 years, going back to the first full year of EIA's weekly gas storage surveys, there have been net injections during one or more weeks in November. In 6 of those years, there have been multiple weeks of net injections. There have also been multiple weeks within the injection season when the weekly change resulted in a net withdrawal. In two of the past five years, 2009 and 2011, inventories on the last day of November have been greater than the tallies for October. In 2012, there was a week with net injections as late as December. Similarly, the nominal beginning of the injection season is April 1 each year, but for 6 of the past 11 years, there have been net injections in March. In the past 12 years, May, June, and September have been the only months that did not have any weeks with net withdrawals. In 2006, there were weekly net withdrawals in July and August, as natural gas was used in the electric power sector to meet high levels of summer air-conditioning demand. The U.S. Energy Information Administration (EIA) has been surveying and reporting weekly gas storage data since March 15, 2002. Before that, going back to 1994, weekly storage was surveyed by the American Gas Association between 1994 and early 2002. The weekly survey covers 80 companies, which account for about 90% of gas storage volumes. The Weekly Natural Gas Storage Report (WNGSR) is one of the U.S. government's Principal Federal Economic Indicators (PFEI). Most of these indicators, which include metrics like employment, international trade, housing construction, and crop production, are released on a quarterly or monthly basis. The WNGSR is one of only three PFEIs published on a weekly basis.